Why should guitarists have the monopoly on pedals? A well made product that's easy and a lot of fun to use and can have some great results. It's just unfortunate it's limited to a few preloaded sounds. Easy to incorporate into your playing. Good quality samples. Well built. Fun. Limited to a small range of preloaded sounds. Meinl joins forces with Germany's highly regarded pickup experts Shadow to offer the player something that's completely unique, great fun to use and might well raise an eyebrow or two at your next rehearsal! The Meinl FX is essentially a self-contained collection of 10 familiar percussion sounds that are housed in an effects pedal-style casing. The body is made of steel with the sides featuring attractive and sturdy oak supports. 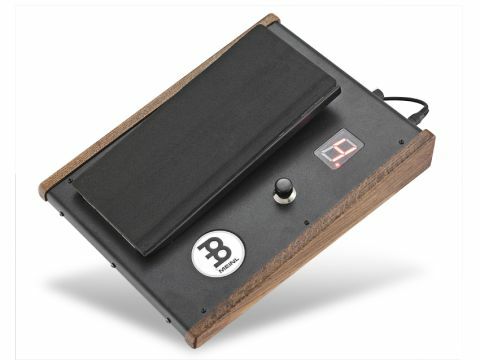 A Wah-Wah style foot pedal acts as a trigger for the sounds and has an easy action as well as feeling and looking like it'll survive the knocks. The sounds are changed with a simple step on a metal guitar pedal-style foot switch, and you can see what sounds you are navigating to via a large red LED numerical display. The included sounds consist of three kick samples, two tambourine, two cabasa, clave, hand clap and dry cowbell. Unfortunately you are limited to these sounds only and somewhat surprisingly there is no way to load further sounds into the unit. The pedal has both mono and stereo outputs so you can connect it to a decent bass/keyboard amp or PA system. There's also a volume pot and mains 9-volt power supply socket and power lead. In action the FX pedal is easy to incorporate into a variety of hand percussion set-ups, which means you could add a kick to timbale grooves and clave or cabasa to your congas. The FX also has much potential when adding sounds to your cajon playing and its shallow design means it doesn't get in the way while you're sat at the kit. The three kick sounds are diverse and effective, ranging from a powerful 'kick bass' to an electronic 'cyber kick' and a cool 'tribal bass' sample. The tambourine and cabasa samples come in straight or double-action versions and with the double version you can trigger one sample as your foot goes down and another as it comes back up. There is also a decent clave, 'dry cowbell' and the classic electronic hand clap. Meinl has always brought exciting new ideas to the percussive table and the FX pedal is a fun way to expand your rhythmic possibilities. It's well made and really easy to play and the sounds (although pretty limited) are all good quality samples. With a piece of kit like this you'll certainly have fun integrating it into your playing, but by using it in the right musical context you'll definitely avoid any novelty-factor issues. Our only reservation is the fact that you are limited to these few sounds only, but as with many other electronic products, Meinl might consider an updated design whereby you can load your own samples - and then we'd really be talking!